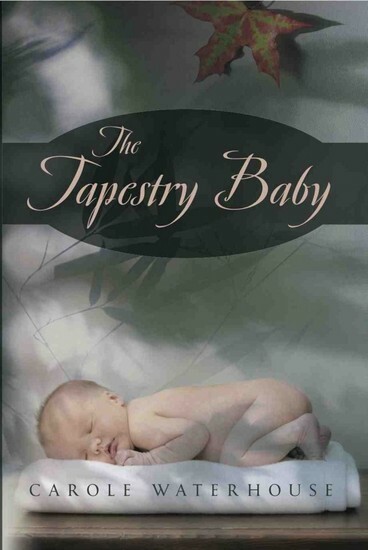 The Tapestry Baby is a literary fiction, the third, by author, Carole Waterhouse. Karin truly believes that her daughter, Anna, was going to be born a tapestry of colours, after Karin becomes pregnant by a tattooed man. She believes Anna is destined for great things and Karin is always looking for "signs". After receiving two very disturbing ones, she decides that she should give Anna to her aunt and uncle to raise, providing Anna with a more financially stable life. Vonnie was introduced to Karin in college, their "friendship" was brief and hardly worth remembering. The day that Karin shows up, pregnant, and talking to Vonnie like they hadn't seen each other in over fifteen years, she is drawn into Karin's world. Vonnie likes to take the interesting pieces of peoples lives and have them published as her own, and Karin is full of interesting stories. She agrees to take Karin and Anna on a journey to find the final "sign", the one that determines Karin's decision for her babies future. Reggie is the tattooed man, covered from head to toe except his right arm, which only sports a deflated heart, and his face! He is a huge man who has serious issues about hurting the people he loves most. After picking Karin up at a bar one night, he is intrigued by her and waits for her return. His past continues to hound his memories and sometimes he isn't sure what is real and what is delusion. Clarissa is a "medium" who influences the lives of Anna and Reggie. She uses an upside down fruit bowl as her crystal ball and steers the course of the lives of those people who come to her door step for her "spiritual" advice! She is horrified when she learns that Karin wants to give Anna up and sets her own agenda for ensuring this does not occur. With several other background characters, they must come to terms with the past, confront their demons that have been chasing them for so long. Anna, the caricature looking baby with the weird laugh may be the answer to all their problems or she may drive them further into themselves, where there is no hope of escape. Will Karin find the final sign or will she hurt herself and her baby before its too late? This wasn't a bad read, the characters are woven with rich and diverse backgrounds. I found how they all interacted with each other to be brilliant, sometimes to the point where the lives of each of the characters cross paths without their realization. Their individual characteristics were well written and weaved the story sufficiently. Anna would be something to view, she was written in such a descriptive way, that I was intrigued by this child whom everyone found strange to look at. I also enjoyed reading about Reggie, his largeness being overshadowed by his fear of crushing things smaller than him. He was endearing to the reader and you couldn't help but having empathy for his plight. At times, I found the story confusing. Some of the back characters are spread out too thin and you have to backtrack a bit to remember who these folks were and how they tied into the story. Though their characters and back stories are well written, their displacement throughout the pages was the hindrance. As well, sometimes Karin's memories would jumble together and flip around and you had to reread a few things to get yourself back to where you were before the glitch in flow. I have mixed reviews about the ending, there were some good outcomes and some that fell flat with me! However, the book was a decent read and good for curling up to on a rainy day! The moment she learns her one-night stand with a tattooed man has made her pregnant, Karin is convinced she will give birth to a baby whose skin is a tapestry of color. When Anna is born normal in appearance, Karin still believes her child is predestined for some greater purpose. She begins a journey, intending to surrender her baby to people she believes will provide Anna a better life than she can. Yet, as she travels, she seeks a sign to tell her whether she should keep her child and discovers her life intertwines those of people she has never met, raising the question of whether anyone is ever really in control of their own destiny.